This week, I received in the mail Rosa del Duca’s book Breaking Cadence: One Woman’s War Against the War. My interest in Rosa’s story is kind of a no-brainer; I’ve been thinking of people like her even before I joined the staff of the Committee for Conscientious Objectors (link is to an archive of the org’s website during my last spring there, before it dissolved after 50+ years and handed its mission to the Center on Conscience and War). The photo on Del Duca’s website even reminds me of myself in those years: Bay Area tan-ish, with gym-toned arms and a wry smile (though I was never as pretty as she). I told the folks at Ooligan Press that I wanted to review it and talk to her, and I will; but right now I need to talk about how I found her, and how this generation of Forever War vets confounds my efforts to end this book. I discovered del Duca first through her podcast, whose subtitle is Insights from a Modern-Day Conscientious Objector — to distinguish her, perhaps, from Vietnam-era civilian COs or World War II figures like Desmond Doss (whose biopic Hacksaw Ridge has acquainted many with the whole concept of a military CO). Hers is among a circle of many that has served as my backdrop in recent days. I’m usually surrounded by the voices of anti-war vets, as the book slouches toward the Bethlehem of publication. But these voices are all in a medium whose power has taken time to dawn on me (a form of radio invented by the iPod).My first podcasts were the usual liberal blather from Slate and the New Yorker, as well as my guilty pleasure West Wing Weekly. My journo friends all got retrained in how to podcast, and certainly the democratic-socialist world where I volunteer is brimming with pods. Which is how, of course, I tumbled down this rabbit hole: I discovered the DSA Veterans Working Group, which includes some of the most cogent voices from this generation of vets. In an upcoming post, I’ll write about each of these, and a few others they’ve turned me on to, such as Eyes Left, hosted by already-celebrities Spencer Rapone and Mike Prysner. I’ll review/recommend episodes that I find particularly strong, and muse about pods’ connection to organizing and activism. But right this second, I’m wondering whether all these pods are just distracting me from writing that still needs to be done. Or are these forever-war vets helping me think more clearly about my final chapter? the other drone veterans, who broke their silence to tell truth about the drone program – and who are still traumatized by it. As warfare has changed, the routes for dissent against it change to, some measured in bits and bytes. Then there’s Will Griffin, who I met at a No Foreign Bases conference and whose Peace Report has long been an essential source of news about that movement. Will moved to my town last year and is burning up the links offered for dissenting veterans here, including Warrior Writers. Working backwards, from this year to 2001, starts to feel as challenging as the dread Vietnam chapter. Reality Winner, whose leaks weren’t about war — but who, like Snowden, was deeply affected by watching drone strikes in near-real time. Will Griffin, the military brat who served in both Iraq and Afpak but flipped 200 degrees after he went to Okinawa for VFP; Griffin also was part of the short-lived Veterans Stand for Standing Rock, and now runs a video-journalism outfit called the Peace Report. Matt Hoh and Rory Fanning, Afghanistan veterans who came out the other side to pursue truth. Chelsea Manning, who contains multitudes (and is now running for Senate.) Brandon Bryant and Heather Linebaugh. Those post-2008 figures don’t mean I’ve forgotten the earlier wave: Garret Reppenhagen, Stephen Funk, Aidan Delgado, Camilo Mejia, Jon Hutto, Dan Choi, Jennifer Hogg. All of whom I need to touch base with before including them now. I swore to start every day freewriting for the book, but every sentence instead comes out like a query letter or status report. I wrote those words nearly a year ago, and they’re still true. More so now, with Will’s video blog competing with those podcasts in my ears. And I’m not even talking about the books they’re all publishing, of which del Duca’s is only one. All still teaching me about their wars, and the many across the globe as I write this. So what war does the chapter cover, anyway? On September 11, I watched appalled as the second tower of the World Trade Center came down. The guards called me out, took me to the lieutenant’s office, shackled and handcuffed me, and took me to solitary. I inquired several times as to why. One guard grunted, ‘Security!’ During twelve days in segregation, no further daylight was provided. One lieutenant came to announce, ‘No phone, no visitors!’ And no stamps. I was locked down ten days before mailing out letters. The result? Limbo-incommunicado. [i] Berrigan told that story to The Progressive after his wife, Liz McAllister, finally learned what the Federal Correctional Institution (FCI) in Elkton, Ohio, had done with him. Berrigan’s detention was not for his own safety but the prison’s: the 77-year-old cleric, veteran of both World War II and a career of serial civil-disobedience, was considered trouble. These words from turbulent World War II veteran/priests could have been read as a repudiation of the newest generation of young soldiers, many of whom had joined or rejoined after the towers went down. But it was also an invitation, if one offered more explicitly by Howard Zinn, who knew from Vietnam and his old friend Dan Ellsberg how powerful those younger voices could be. And just as protestors were flooding the streets, one tall young Army sniper was walking into an alternative bookstore in Manitou Springs, Colorado and being told that before going to Iraq, he had to read Zinn’s flagship work A People’s History of the United States. That sniper was, of course, Garett Reppenhagen, who I met when he was president of Iraq Veterans Against the War and who’s now a coordinator for the VetVoice Foundation. Garett, Stephen Funk and Aidan Delgado are among those I know I want to keep in the chapter, but I don’t really want the book’s narrative to end with the end of the Bush Administration. This last revision process is reminding me of so many other threads that need to resonate, and for which I am so far unprepared. How can the chapter include mostly White voices, even if their movement is not as multi-racial as the U.S. military? Or am I answering my own question here? But if this latest dance with the podcasters is teaching me anything, it’s that this generation doesn’t need me to tell their story. They’re telling it every day, in every form of media that exists. It’s my job to put it all in context, and make their part of our story sing. I was reshaping my Civil War chapter, with a scene on May 12, 1861 — with soldiers in the newborn Union Army singing a song for John Brown. That happened at Boston’s Fort Warren, on the harbor’s Georges Island. As I was trying to evoke that day, I realized a potential problem; I’d begun the prior chapter in Portsmouth, New Hampshire, as members of that state’s Seventh Infantry boarded a train in 1846 taking them to the Mexican-American War. (Above is a rendering of their base, Fort Constitution. Did I need to ditch one of those scenes, and avoid the rhyme? In some ways, however, the imperfect rhyme made sense: the wars were very different, but some of the themes and players were the same. That earlier war had a lot to do with slavery, something the soldiers in 1846 had likely heard from New England preacher William Lloyd Garrison. Just west of Portsmouth, in Springfield, MA, John Brown was making a name for himself as a wool broker, joining the local Black church, and becoming part of the Underground Railroad. And it was Brown, as much as anyone else, who persuaded many anti-slavery activists that slavery could only be ended with violence. So the young men convened at Fort Warren that day, mostly members of the 11th and 12th Massachusetts Regiments of the newborn Union Army, were not just responding to April’s assault on Fort Sumter by the Confederacy. They had grown up hearing about the Slave Power, the powerful Southern planters who controlled half the national economy with a product born of free labor. They knew about that previous war, with Mexico, which ended with two new slave states in the Union. They knew about Bleeding Kansas, right after that war ended, in which pro-slavery Missourians battled “Free Staters,” the latter under the leadership of John Brown. The election of Abraham Lincoln, the previous fall, had been followed by the secession of most Southern states, and the assault on Fort Sumter. No surprise, then, that when they wanted to relax and sing a drinking song, they chose this one. I don’t know if those soldiers thought of themselves as dissenters, though I’m choosing to include the entire Union Army as acting in dissent. Certainly Ambrose Bierce did, signing up with the Ninth Indiana around that same time, honoring an uncle who’d supplied guns to John Brown, while Harriet Tubman was already a Union spy, committing gender-dissent in her field-hand disguise. Not to mention Frederick Douglass’ sons, among the very first U.S. Colored Soldiers, or Jesse Macy, a Quaker who insisted on becoming a battlefield medic, thus creating a new form of conscientious objection. I’ve been saying that “The Civil War flips the script on dissent,” a cheap phrase that nonetheless conveys how disorienting it feels for me, an anti-war writer, to count as ways my characters whose actions helped one side kill multitudes. What is less in dispute: they felt they were creating something entirely new, and willing to die for it. So far, my chapters have started only in the Northeast: Chapter One in on a Pennsylvania battlefield, Two in a Bronx boarding house, and now this twofer for Portsmouth and Boston. Though both of these chapters then venture far west and south, from Kansas to Cuernavaca. I hope readers don’t find problematic my using these New England stories as springboards, but so much American dissent was born there right along with the country. Just as disorienting, of course, is alternating between these final revisions and reporting on present-day dissenters like Reality Winner. Unstuck in time no longer covers it. The summer before Evan Thomas leaves the country, 1915 smells of war. The smell sickens Thomas, a lean young man with a narrow face and alert eyes. Thomas hates living and working at the American Parish, the East Harlem immigrant settlement house pastored by his brother Norman. On every newsstand, headlines scream of battles in Europe and news from Mexico, whose unfinished revolution now includes tens of thousands of U.S. soldiers and sailors. The parish’s immigrants look on with anxiety: They don’t need English to count the European war’s twelve battle zones. America is officially neutral in that conflict, unlike New York City. Two weeks ago a German submarine attacked the luxury liner Lusitania, leaving 43 Americans among 1153 dead – including one of New York’s own, the dashing millionaire Alfred Vanderbilt. Both tabloid and broadsheet newspapers call Germans “murderers” and demand vengeance. The city’s boy-mayor calls for “preparedness,” as if it’s possible to be prepared for hell. Even Union Theological Seminary, where Thomas is pursuing a divinity degree, offers little respite. It clusters next to Columbia University, whose flagpoles urging students to “cherish, love and respect ….] the flag of peace and prosperity.” Both campuses mark the 1779 Battle of Harlem Heights. At the seminary, Thomas’ classmates discuss what “preparedness” will require of them. On Memorial Day tens of thousands cram onto Riverside Drive, to see the veterans of five conflicts march uptown to the Soldiers and Sailors Memorial. Elderly Union soldiers and sailors, their uniforms carefully mended for the occasion, march past signs of the city’s growing wealth: At 74th Street, the veterans and some active-duty troops slowed as they passed Riverside, the three-block French castle built by German immigrant and steel magnate Charles Schwab. At the memorial, a Greek marble stand of Corinthian columns, the United Spanish War Veterans salute General Leonard Wood and retired Rear Admiral Sigsbee, who commanded the U.S.S. Maine when it exploded. Thomas doesn’t go across town to watch the spectacle. A few weeks later, a similar scent suffuses Princeton, when Thomas goes down for his brother’s graduation. The site of both a 1777 battle and the 1781 Mutiny in January, his alma mater has whole rooms honoring alumni on both sides in the Civil War; at the graduation, its president tells the graduating class of the dangers of peace. If they avoid war, he says, they might lose the chance to become real men.Thomas and some fellow alumni, self-named “the Crusaders,” huddle to wonder aloud what that means for them. The group’s founder, also a Union minister, says the choice is clear: Jesus did his best to stop violence, after all. i Thomas squints into the blinding sunlight. Thanks for the inspiration, Louisa Thomas. I hope you don’t mind how I reframed the moment you found, and wrote about in Conscience:Two Soldiers, Two Pacifists, One Family — A Test of Will and Faith in World War. Tomorrow’s NewsworksWHYY piece will focus on the new book Tomas Young’s War — whose author, Mark Wilkerson, came to Philadelphia.The book chronicles Young’s final years, after an embolism stole the activist’s voice and ultimately his life. (Anoxic brain injury, for those in the know.) I read it in a day, cried a lot. More later, and I’ll add live links as they post. As a civilian, I’m not in a position to scold anyone for what they do this weekend. For me, it’s time to give respect to the dead, even as we question why. My book has a quiet backbeat of gender-dissent, separate from but not irrelevant to its years of conscientious objectors, mutinies and warrior writers. From the beginning, we had women dressing as men to fight, from the Revolution to the Civil War; we had women codebreakers and nurses during World War I and II, and an increasing number of women explicitly recruited starting in 1960, including later acclaimed peace veteran Ellen Barfield (above). Still, when women started to claim their own right to be there, it made some noise no one expected — especially in the 1990s, after the Tailhook scandal exposed what so many women had been enduring all along. I’ve realized that much of this important work is too tangential to be described in-depth in Ain’t Marching … so below is some of what I learned, in case it’s of use. Ride her down a bumpy street. . . While that chant was an extreme example, the devaluing of women was still a staple of much military culture and training, even as they were recruited in increasing numbers (by 1996, women would constitute 13 percent of personnel, from 5 percent of Marines to 16 percent of the Air Force). Some was signaled indirectly, in what is sometimes termed “gender harassment” of women with whom they were ordered to work: “sabotage, foot-dragging, feigning ignorance, constant scrutiny, gossip and rumors, and indirect threats. This harassment targets women but is not sexual: often it cannot be traced to its source,” ii exemplifying the term “hostile environment” even as it was being documented and defined in the legal language of sexual harassment. i Carol Burke, Camp All-American, Hanoi Jane, and the High-and-Tight: Gender, Folklore, and Changing Military Culture (Beacon Press, 2004). ii Laura Miller, “Not Just Weapons of the Weak: Gender Harassment as a Form of Protest for Army Men.” Social Psychology Quarterly, March 1997, p. 33.
iii Helen Michalowski, “The Army Will Make a ‘Man’ Out of You.” In Pam McAllister, ed., Reweaving the Web of Life: Feminism and Nonviolence (New Society Press, 1982). iv David Grossman, On Killing, op. cit. 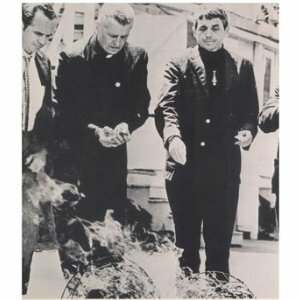 On Memorial Day, remember these priests, poets, politicos and pranksters! That’s how I’ve tended to characterize the huge, diverse and boisterous movement working to stop the U.S, war against Vietnam, 1963-1975. I should have written an essay here about them last month, for the anniversary of the 1975 evacuation of the U.S. Embassy in Saigon, but I could barely fit them in a chapter for the book. Rev. 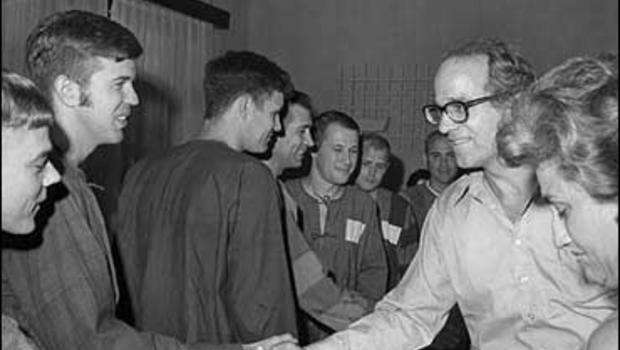 William Sloane Coffin, greeting POW Americans in North Vietnam. Former Army intelligence officer William Sloane Coffin, founder of the hugely influential Clergy and Laity Concerned About Vietnam (CALCAV). 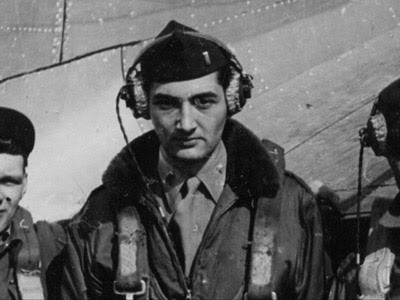 Howard Zinn, whose long career as an historian, organizer and inspiration to us all was preceded by the young (already anti-fascist) bombardier seen at right. Burning draft cards in Catonsville. Md. Philip Berrigan, survivor of the Battle of the Bulge, shown here in prhaps the moment symbolizing his work during Vietnam — one of the first stops in a lifetime of anti-militarist civil disobedience. 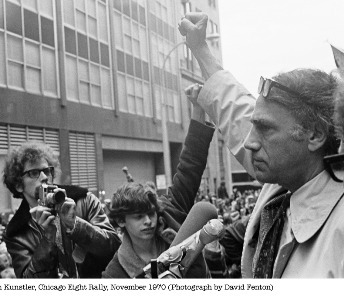 Former Army cryptographer William Kunstler, who followed his Pacific service by co-founding the Center for Constitutional Rights, which represented war resisters from Berrigan, above, through the years to Gulf War objector Colleen Gallagher in 1991. In 1968, his face and voice became inescapable during the trial of the Chicago Seven, as at right. 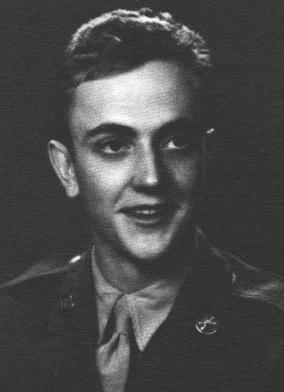 And this skinny little private was Kurt Vonnegut, Jr, captured in the Battle of the Bulge, he became a prisoner of war — and turned that exoeriene into one of the strongest anti-war novels ever written. I’ll post the link tomorrow, which includes more on all of these. There are so many more who I couldn’t squeeze l into 750 words: not Lew Ayres and the other World War II COs, not Rev. Paul Moore, who found his pacifism after the abbatoir of Guadalcanal. But I still think this is a fine Memorial Day tribute to those lost in all our wars.